In 2014 I wrote Three Stone Stories, a quick and easy solo story game that used simple dice mechanics to resolve challenges — challenges that told a story. Now I’m putting the final touches on a playtest version of the updated game. The mechanics have been totally reworked, making each die roll more important to the story you’re telling. Some concepts introduced in the first version of the game are still there, but I’ve worked hard to make the game more fun and playable while keeping things streamlined. Challenges still form the basis of the game and are the main aspect driving the story. The rules include simple instructions for creating meaningful Challenges, but they’re still as intuitive as asking a question. Banes have been replaced with Consequences, and you suffer more of them than before. Consequences drive the story to some degree and also aid the major villain in your story. Watch out! Boons are still around. Who doesn’t like Boons! Now you have a chance of gaining more Boons per Challenge, and they have a greater impact on the story, giving you some control over your hero’s fate. The biggest addition is a section on Group Play, which details how to use the rules to play in a group, with or without a Game Master. When the full rules are released I’ll include six or more adventures, each offering a jumping-off point for your Three Stone Stories. Each adventure will be vastly different from the others, giving you an excellent look at the variety of stories you can tell (or play) with the game. Each subscriber will get a free copy of the playtest rules when they launch. Every patron on Patreon gets a free copy on launch day. Buy it on Drive Thru RPG. 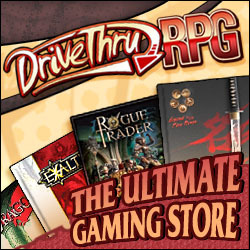 The playtest rules will sell for $1 on Drive Thru RPG. Why a dollar? It’s my experience that people who’re invested in the game are more likely to provide feedback, so we’re not giving it away to any old Joe. The bonus with this option is that you’ll get the full version of the game for free. We’re not making you pay twice. I hope you’ll join us in making Three Stone Stories an excellent game. Masks are eery and mysterious — even a “funny” mask can seem ominous and threatening. Masks can represent a culture or tell a story — there’s so much to these objects that can inspire your game, and that inspired me to write the Manual of Masks, a supplement for fifth edition Dungeons & Dragons, now available on the DMs Guild. Recently I gave you a sneak peek at two of the player options featured in the book. The Manual of Masks also includes new adventuring gear, including the alchemist’s mask, armored hoods, and the infamous iron mask. There are also rules for headshots, called shots, and hit locations. Rounding everything off are 12 new magical masks. The book is $1.25 on the DMs Guild. I’ve already started work on the next 10 pages of the book, and the plan is to upgrade it later in the year. The update will likely include a section on Mask, the god of thieves, some cursed masks (so much fun to be had!) and some mask related adventure seeds. I’d love to add more class options, so featuring Mask will be a great way to offer more options for the cleric class. We’ve got a bunch of books in the works, but I wanted to take a moment to give you a sneak peek at three new 5e character option previews for your D&D game. The first two are from my forthcoming Manual of Masks for the DMs Guild, and the third option is for our third Choose Your Destiny book. Here’s an exclusive preview of the forthcoming Manual of Masks cover. Masks have a mysterious, otherworldly nature, which certainly inspired this first one. There’s a pinch of inspiration from The Mask comics and movies too. At 3rd level, when your otherworldly patron bestows a gift upon you, you may instead select the Pact of the Mask instead of the three pact boons given in the Player’s Handbook. The basic concept of the mask mage is a wizard that imbues masks with spells. Imagine reaching into your coat to bring out a different mask for each challenge you face and you’ll have some idea what this one’s about. Searching for a way to extend the life of their spells, an obscure order of mages perfected the art of imbuing masks with magical energies. As a student of their legacy, you are able to use the power in these masks to become a fearsome entity on the battlefield or to doll out powerful masks to your allies to enhance and protect them against enemies. The last of our 5e character option previews is inspired by good old Conan and designed to fill the needs of solo players in our Choose Your Destiny campaign. Some barbarians value self-sufficiency and personal endeavor over all else — for the warrior who can stand alone is a much stronger defender of the tribe. The Path of the Lone Wolf is an often lonely path to greater glory, lined with the bodies of one’s enemies. As a follower of this path, you trust in your weapon and wit to see you through any trial. At 3rd level, you may select the Path of the Lone Wolf instead of other primal paths. Starting when you choose this path at 3rd level, when you enter a rage you regain hit points equal to your proficiency bonus. From 11th level, when you would drop to 1 hit point because of your Relentless Rage ability, you instead drop to 1d4 + your proficiency bonus. You can get the playtest versions of all these options and more by supporting us on Patreon at the Flaming Backer tier. Additionally, if you provide us with playtesting feedback, we’ll put your name in the book’s credits. Playtest packages go out tomorrow, so jump aboard now if you want them. I hope you enjoyed these 5e character option previews. Till next time, play good games! If, like me, you can’t get enough mask-inspired mayhem, do check out the great CGI short Majora’s Mask – Terrible Fate on YouTube. For a long time I was against using Patreon. To me, it was just a way to ask for money. Still, I was starting to see a bunch of Patreon campaigns that had a great offering, that gave customer something special, and that were worked as an invaluable part of the business for the company or individual that was running it. On top of that, I’ve come to realize that Patreon is the perfect platform for offering a subscription service. And, we make adventures we’d like to publish monthly. Sounds like a great fit to me. Now we can offer a subscription for our products similar to what Paizo does with many of their product lines. That’s exciting, because it also means we can better connect with you, our fans. We’re in the early days of launching our Patreon campaign, but now is a great time to jump on board and help us chart this new course. We’ve set up some tiers we think you’ll really like. At this tier you’ll get a page or two of game mechanics, and 2-3 wallpapers from Bob Storrar, usually including art from our latest release. And it only costs a dollar. If you’re a fan of our Choose Your Destiny solo and 1-on-1 adventures, then check out our Patreon and ensure your copy of the next installment in the campaign at this patron tier. So far we have two adventures in the series out, with another two in editing. Three more are on the cards. All the adventures are compatible with the fifth edition of Dungeons & Dragons, through the SRD and OGL. The peaceful village of Yamamura has had a good summer; the rice stores are full to bursting and even lord Honda looks pleased for once. So, as the momiji leaves turn to yellows and reds, the villagers gather for their annual autumn festival. Food stalls, games, gossip, the sweet sounds of shakuhachi and shamisen music, followed by colorful fireworks and dancing into the night. It will be a night to remember. Yet, for Constable Hideo there are always things to worry about; the many visitors and the ample supply of sake for one. Mix the two together and this night may not be so peaceful after all. And then there are the Inoue girls, Ame and Yuki. In a village where everyone knows your secrets, they still manage to keep the gossip fresh, and biting. Old Sanae remembers when she too was young and beautiful, while the appearance of an old love interest does nothing to shake the reminder that the past will always come back to haunt you. And it’s the past that most concerns Father Vicente, the Spaniard, who remembers the fervor he once had for his faith; if only he could recapture that passion, yet his heart grows colder as the nights do. And out in that darkness a malicious force moves, ready to strike a blow that will leave the village irreversibly scarred and in dire need of heroes to make their stand. A Pathfinder Roleplaying Game adventure set in mythical Japan for 6 characters of level 3 and a GM. Rising Phoenix Games has some new, exciting titles for you. Climb into the Praetor or Vindicator Class Kaiju-Hunter mecha and take the battle to the stars. Mecha—A Field Guide introduces two new mecha along with all the rules for operating, customizing, and combat with these iron giants, all fully compatible with the Starfinder Roleplaying Game. Three powered armor suits, new weapons, and armor upgrades expand your ironclad arsenal. Forest of Secrets is the newest installment in the Choose Your Destiny series of solo and 1-on-1 adventures, compatible with fifth edition fantasy. Written by David N. Ross, it includes a useful forest generator for use in your games. Can you survive the Forest of Secrets? 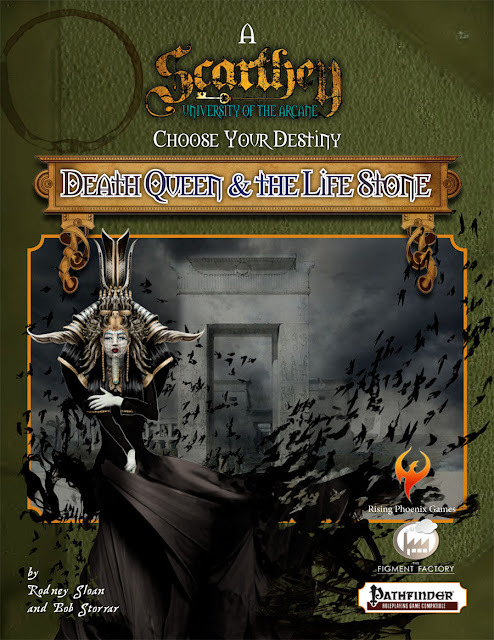 Death Queen and the Life Stone kicks off the Choose Your Destiny series with an undead queen attempting to rise again. Can you escape her trapped temple and stop her, before it’s too late? Get the most out of Death Queen and Forest of Secrets with Welcome to Scarthey, your guide to the world of arcane studies. Inside you’ll find details of the University of Scarthey, introductions to key NPCs, and plenty of player options. Last up, Gear Heart is an encounter involving agents of the University of Scarthey attempting to uncover the secrets of a mysterious tower. A short adventure for a party of 4 characters between level 1 and 5, compatible with the Pathfinder Roleplaying Game. From the creator of Lunatic Labyrinth comes a new solo adventure, the first in a series of solo adventures revolving around Scarthey, the University of the Arcane. The Stone of Ashirai—said to contain power over life itself—is rumored to lie within the tomb of the goddess Ashirai, the Death Queen. Can you be the first to reach her tomb, find the stone, and survive to tell the tale? This is our latest cover, a piece for our first product in a new line of solo / 1-on-1 adventures. Bob Storrar did the art and layout, and you need to see inside this, because it’s beautifully done. The guy has real talent. So, who is she and why does she matter? Ashirai was once a fair and beautiful queen, who turned to necromancy to secure her power. That power came at a price, as she slowly lost her famed beauty to the corrupting energy of her magic. She took to wearing a cobra hooded mask carved to resemble her as she once was, and became known as the Death Queen, a powerful ruler with legions at her command. South Africa’s longest running comics and games convention, ICON, celebrated it’s 25th year this year. We were there running demo games of the Pathfinder Roleplaying Game, as well as to attend workshops by Paizo’s own James L Sutter, who spoke about the industry and, most importantly, Starfinder. We’re not saying much just yet, but we have some cool stuff in the works that will be Starfinder compatible. Watch this space. Bullet is a faced paced, rules light special forces game by Basil Koufos. If you’ve ever thought playing CS the RPG might be a cool idea, then this game is for you. Gear Heart is an adventure short—an adventure setup, map, and encounter—compatible with the Pathfinder Roleplaying Game and set in Scarthey, the University of the Arcane. The party is called in to investigate a mysterious tower which appears once every three years on the night of the winter solstice. Besides our Starfinder offering, we’ve begun work on Secrets of Scarthey, our follow up book to Welcome to Scarthey, aimed at GMs. We’ve also got several more adventures in the works, which all tie in with the setting. All of our adventures will either be compatible with the Pathfinder Roleplaying Game, or the fifth edition SRD, and our setting books will be available in both flavors. That’s it from me. Have a great weekend.